Back in the day when city people lived in ill-constructed tenement apartments, you could always tell when your upstairs neighbor was getting ready for bed. First, they'd creak across the ceiling of your bedroom over to the bed. Then, you'd hear the first shoe go "clunk" against the floor as they kicked it off and let it fall. It was futile to try to go to sleep before you heard the second shoe drop because that second "clunk" would wake you up again. Hence, the downstairs-dweller would be stuck waiting for the other shoe to drop, unable to relax and go back to sleep. For many years, those of us who are able to add up total government debt and subtract national income as taxpayers lose their jobs to globalization or to the Obama depression have been warning that our nation is on a spending path that simply can't go on forever. Twenty years ago, we were laughed at - "Of course, we'll pay everybody's Social Security - it's required by law!" As more and more people began to catch on to the reality of the coming fiscal train wreck, we were accused of meanness for wanting to slash all those hard-earned government pensions and health benefits. At long last, the New York Times is writing about the coming financial crisis. They've dropped the first shoe, and not before time. The teaser for their lead story of May 23, 2010 was, "The deficit crisis that threatens the euro along with an aging population and low growth has undermined the sustainability of Europe's standard of social welfare." This sentence, while perfectly true, ranks up with Japanese Emperor Hirohito's observation following the nuking of Hiroshima and Nagasaki that "the war in the Pacific has proceeded not necessarily to our complete advantage." Talk about an understatement! We'd say "annihilated" rather than "undermined" or the Emperor's more convoluted expression. Europeans have benefited from low military spending, protected by NATO and the American nuclear umbrella. They have also translated higher taxes into a cradle-to-grave safety net. "The Europe that protects" is a slogan of the European Union. Americans have known for a long time that our defense spending has made it possible for Europe to get a free ride, but even that subsidy is not enough to preserve the European welfare system. Anybody who thinks about the situation for very long realizes that no government can spend more money than it collects in taxes forever - something has to give when lenders won't lend any more. As Margaret Thatcher put it, "Eventually you run out of other people's money." Much as we'd like to believe that Europeans understand that their system can't go on, the riots in Greece and the union-driven protests in France suggest that most people who benefit from the current system are in no mood to consider cutting their benefits. Although polls say that a majority of French citizens agree that the current pension system must be changed, they oppose cutting benefits or raising the retirement age. If you can't impose either of those fixes, what can you do? People are living longer than they used to - instead of collecting for 3 or 4 years, retirees collect for 30 or 40 years. Today's retirees had too few children to sustain the system. 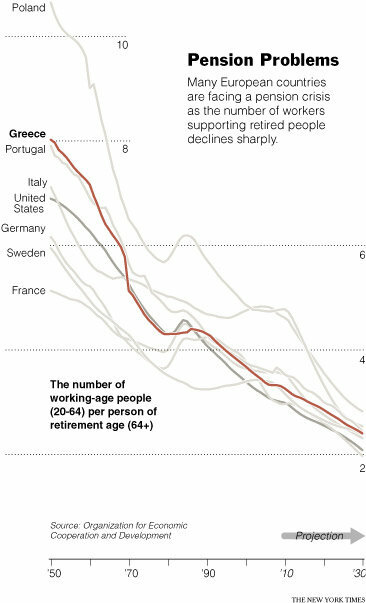 The graph makes the coming crisis all too clear - it would take a 25% pension-tax rate for two workers just to support one retiree at 50% of final pay, and that simply can't happen. Even if it could, many public-sector pensions pay more than the employee earned while working. That would require a 50% tax on two workers just for pension purposes - plus whatever else government wanted to spend on everything else. When something simply can't go on, it won't. Will They Drop The Second Shoe? The Times' article describes the situation in Europe, of course. They're not yet ready to point out that American finances are in equally bad shape. Mixed in with all the articles about the Greek overspending crisis, we've seen many which claim that America is not Greece and that our deficits are far more manageable. These articles generally claim that we're in good shape because the American deficit is about half of annual GNP whereas Greek debt is more than their annual GNP. This lie omits the awkward fact that, assuming that we actually intend to honor our commitments to retirees and the newly-insured who expect to benefit from Obamacare, our total future obligations far exceed our annual GNP. We don't know how much bigger Greece's debts are than have been publicly disclosed - politicians love to lie about what they've promised to spend in the future - but the hidden obligations we've taken on put us in worse shape than Greece. The Wall Street Journal points out that the Taxed Enough Already (TEA) party and the government employee unions are the two biggest players in the coming November elections. Even though public sector pay is about 30% greater than comparable jobs in the private sector, our government unions aren't any more eager to see their pensions and benefits cut than the Greek or French unions who're leading the riots. On the other hand, the Tea Party people have seen our current government-inspired depression annihilate their retirement investments. They don't like seeing their retirement benefits disappear any more than unions enjoy pension cuts and they aren't eager to pay for the pensions and benefits the politicians promised the unions. The tea parties seem to have been triggered by the prospect of paying for Obamacare while watching their own health care fall apart, but they're also beginning to see that the other government entitlements are equally unaffordable. Although the New York Times includes labor unions when complaining about "special interests" who control Albany and keep spending high, they haven't written much about the looming liabilities we're facing with respect to public pensions that were negotiated in the past. California, New Jersey, Michigan, Illinois, and New York are facing debt-to-income problems which are comparable to the numbers which triggered the Greek crisis. The rest of Europe created a trillion-dollar fund to help bail out the free-spending Greeks, Portuguese, Spanish, and Italians. A major portion of Mr. Obama's trillion-dollar stimulus went to state governments so they wouldn't have to cut government employee pay, but that's not likely to happen again. Will the Second Shoe Fall? The outline of the coming train wreck has been obvious for many years. The Times has dropped the first shoe in pointing out the magnitude of the coming European disaster. Will they drop the second shoe and explain that America faces the same problem? Or are they afraid that if the Tea Party folks understood the full magnitude of the coming government-inspired disaster that they'd vote all the rascals out? Great article. Getting the country well under budget is the #1 issue that must be resolved in our government today. The only fix is a lot of very hard pain which will not be suffered voluntarily. In other words people will half to die before politicians develope the balls to do what's neccessary...if then. For our part, stop demanding government fix your personal problems. I'm afraid Obama just something else stupid, taking responsilbilty for the oil spill. Is the U.S. doing enough to keep debt from spiraling out of control? The signs are not encouraging. Before this recession it appeared that absent action, the government's long-term commitments would become a problem in a few decades. I believe the government response to the recession has created budgetary stress sufficient to bring about the crisis much sooner. Our generation - not our grandchildren's - will have to deal with the consequences. governor, has some interesting long-range plans, but he needs to explain how to fix the budget crisis. And now. Mr. Cuomo correctly points out that the health care and education systems in New York are among the costliest in the nation. Some of his proposals to organize and pare these costs make sense - including a complete state takeover of the administration of Medicaid from counties. That could not happen quickly enough to help with this year's budget problems. Nor will his proposal to streamline an overlapping, multilayered bureaucracy. His more immediate budget solutions, which include a salary freeze for state workers, are clearly meant to appeal to Republican voters. Mr. Cuomo also wants no new taxes, no more borrowing and caps on property taxes and spending. We are eager to hear the details of how that balances the budget. The WSJ warns that we are heading the same way, fast. The increasing size of the federal work force is an early indication of what lies ahead. The Bureau of Labor Statistics reports that in the last year the federal government added 86,000 permanent (non-Census) jobs to the rolls. And high-paying jobs at that: The number of federal salaries over $100,000 per year has increased by nearly 50% since the beginning of the recession. Today, the average federal worker earns 77% more than the average private-sector worker, according to a USA Today analysis of data from the federal Office of Personnel Management. To pay for bigger government, the private sector will bear a heavier tax burden far into the future, suppressing the innovation and entrepreneurship that creates growth and real opportunity, not to mention the revenue that pays for everything else in the first place. If these trends are not reversed, it is hard to see how our culture of free enterprise will not change. More and more Americans, especially younger Americans, will grow accustomed to a system in which the government pays better wages, offers the best job protection, allows the earliest retirement, and guarantees the most lavish pensions. Against such competition, more and more young, would-be entrepreneurs will inevitably choose the safety and comfort of government employment-and do so with all the drive that is generally thought to be "good enough" for that kind of work. What will happen as our increasing number of state employees confront a shrinking private-sector tax base? Just look to the streets of Athens. Is the Times catching on? Or is this an aberration? It's time to consider whether cutting rather than increasing spending might be the real path to economic recovery. Here's another one! The Times reports that being anti-union is becoming good politics! Republicans have often railed against public employees' pay and benefits, but now friends of labor are joining in. European officials are concerned that a crisis like the one that hit Greece this year could spread to Ireland and Portugal. LONDON — European officials, increasingly concerned that the Continent’s debt crisis will spread, are warning that any new rescue plans may need to cover Portugal as well as Ireland to contain the problem they tried to resolve six months ago. Now the Times thinks that the situation in some states is really bad. m They think the feds will have to bail out the states, but admit that this will be difficult given the current political climate. Last year, the feds paid ONE THIRD of state budgets! This has gotta stop! The budget imbalances and debt in states and localities remind some analysts of the run-up to the subprime mortgage meltdown, or of the crisis hitting Europe. Times says young Europeans are getting frustrated over no job prospects, and the pension system is going broke. Experts warn of volatility in state finances and the broader society as the most highly educated generation in the history of the Mediterranean hits one of its worst job markets. A Greek rescheduling could set a worrisome precedent. But no serious banker any longer believes Greece can pay all that it owes on time. Greece got itself into this mess. But Europe will have to help it get out. It will become even harder the longer Europe waits and pretends. WHY should Europe help? The Times admits Greece did this by itself; why should the taxpayers of the rest of Europe bail Greece out?